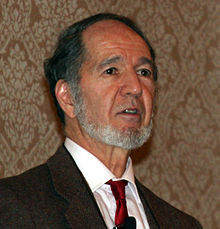 Jared Diamond (born 10 September 1937) is an American evolutionary biologist, physiologist, bio-geographer and nonfiction author. He is best known for the Pulitzer Prize-winning book, Guns, Germs, and Steel (1997) and for Collapse: How Societies Choose to Fail or Succeed (2005). Put another way, the chimpanzees' closest relative is not the gorilla but humans. We have already discovered two species that are very intelligent but technically less advanced than us — the common chimpanzee and pygmy chimpanzee. Has our response been to sit down and try to communicate with them? Of course not. Instead we shoot them, stuff them, dissect them, cut off their hands for trophies, put them on exhibit in cages, inject them with AIDS virus as a medical experiment, and destroy or take over their habitat. That response was predictable, because human explorers who discovered technically less advanced humans also regularly responded by shooting them, decimating their populations with new diseases, and destroying or taking over their habitat. Any advanced extraterrestrials who discovered us would surely treat us in the same way...If there really are any radio civilizations within listening distance of us, then for heaven's sake let's turn off our own transmitters and try to escape detection, or we are doomed. Just as strawberries are adapted to birds, so acorns are adapted to squirrels, mangos to bats, and some sedges to ants. That fulfills part of our definition of plant domestication, as the genetic modification of an ancestral plant in ways that make it more useful to consumers. But no one would seriously describe this evolutionary process as domestication, because birds and bats and other animal consumers don't fulfill the other part of the definition: they don't consciously grow plants. White blood cells and other cells of ours actively seek out and kill foreign microbes. The specific antibodies that we gradually build up against a particular microbe infecting us make us less likely to get reinfected once we become cured. As we all know from experience, there are some illnesses, such as flu and the common cold, to which our resistance is only temporary; we can eventually contract the illness again. Against other illnesses, though—including measles, mumps, rubella, pertussis, and the now defeated smallpox — our antibodies stimulated by one infection confer lifelong immunity. That's the principle of vaccination: to stimulate our antibody production without our having to go through the actual experience of the disease, by inoculating us with a dead or weakened strain of microbe. Technological advances seem to come disproportionately from a few very rare geniuses, such as Johannes Gutenberg, James Watt, Thomas Edison, and the Wright brothers. They were Europeans, or descendants of European emigrants to America. So were Archimedes and other rare geniuses of ancient times. Could such geniuses have equally well been born in Tasmania or Namibia? Does the history of technology depend on nothing more than accidents of the birthplaces of a few inventors? The infectious diseases that regularly visited crowded Eurasian societies, and to which many Eurasians consequently developed immune or genetic resistance, included all of history's most lethal killers: smallpox, measles, influenza, plague, tuberculosis, typhus, cholera, malaria, and others. Compressing 13,000 years of history on all continents into a 400-page book works out to an average of about one page per continent per 150 years, making brevity and simplification inevitable. Yet the compression brings a compensating benefit: long-term comparisons of regions yield insights that cannot be won from short-term studies of single societies. The details of which candidate said what during a single televised debate in October 1960 could have given the electoral victory to Nixon instead of to Kennedy, but no details of who said what could have blocked the European conquest of Native Americans. Two types of choices seem to me to have been crucial in tipping their outcomes towards success or failure: long-term planning, and willingness to reconsider core values. On reflection, we can also recognize the crucial role of these same two choices for the outcomes of our individual lives. [..] the values to which people cling most stubbornly under inappropriate conditions are those values that were previously the source of their greatest triumphs. Cited by Tim Flannery, "Learning from the past to change our future", Science, volume 307, 7 January 2005, page 45. Religious values tend to be especially deeply held and hence frequent cause of disastrous behaviour. [...] The modern world provides us with abundant secular examples of admirable values to which we cling under conditions where those values no longer make sense [...] It appears to me that much of the rigid opposition to environmental concerns in the First World nowadays involves values acquired early in life and never again reexamined [...]. Chapter "Why do some societies make disastrous decisions", section "Disastrous values" (Penguin Books, 2011, pages 432-433, ISBN 978-0-241-95868-1. My views may seem to ignore a moral imperative that businesses should follow virtuous principles, whether or not it is most profitable for them to do so. Instead I prefer to recognize that, throughout human history, [...] government regulation has arisen precisely because it was found to be necessary for the enforcement of moral principles. Invocation of moral principles is a necessary first step for eliciting virtuous behavior, but that alone is not a sufficient step. Chapter "Big businesses and the environment: different conditions, different outcomes", section "Businesses and the public" (Penguin Books, 2011, pages 484-485, ISBN 978-0-241-95868-1. Businesses have changed when the public came to expect and require different behavior, to reward businesses for behavior that the public wanted, and to make things difficult for businesses practising behaviors that the public didn't want. I predict that in the future, just as in the past, changes in public attitudes will be essential for changes in businesses' environmental practices. Chapter "Big businesses and the environment: different conditions, different outcomes", section "Businesses and the public" (Penguin Books, 2011, page 485, ISBN 978-0-241-95868-1. Those numbers ay not sound like a bid deal until one reflects that average global temperatures were "only" 5 degrees cooler at the height of the last Ice Age. About global warming. Chapter "The world as a polder: what does it all mean to us today? ", section "The most serious problems" (Penguin Books, 2011, page 493, ISBN 978-0-241-95868-1. Thus, because we are rapidly advancing along this non-sustainable course, the world's environmental problems will get resolved, in one way or another, within the lifetimes of the children and young adults alive today The only question is whether they will become resolved in pleasant ways of our own choice, or in unpleasant ways not of our choice, such as warfare, genocide, starvation, disease epidemics, and collapses of societies. While all of those grim phenomena have been endemic to humanity throughout our history, their frequency increases with environmental degradation, population pressure, and the resulting poverty and political instability. Chapter "The world as a polder: what does it all mean to us today? ", section "If we don't solve them..." (Penguin Books, 2011, page 498, ISBN 978-0-241-95868-1. "The environment has to be balanced against the economy." This quote portrays environmental concerns as a luxury, views measures to solve environmental problems as incurring a net cost, and considers leaving environmental problems unsolved to be a money-saving device. This one-liner puts the truth exactly backwards. Environmental messes cost us huge sums of money both in the short run and in the long run; cleaning up or preventing those messes saves us huge sums in the long run, and often in the short run as well. In caring for the health of our surroundings, just as of our bodies, it is cheaper and preferable to avoid getting sick than to try to cure illnesses after they have developed. Chapter "The world as a polder: what does it all mean to us today? ", section "One-liner objections" (Penguin Books, 2011, page 503, ISBN 978-0-241-95868-1. In fact, one of the main lesson to be learned from the collapses of the Maya, Anasazi, Easter Islanders, and those other past societies (as well as from the recent collapse of the Soviet Union) is that a society's steep decline may begin only a decade or two after the society reaches its peak numbers, wealth, and power. [...] The reason is simple: maximum population, wealth, resource consumption, and waste production mean maximum environmental impact, approaching the limit where impact outstrips resources. On reflection, it's no surprise that declines of societies tend to follow swiftly on their peaks. Chapter "The world as a polder: what does it all mean to us today? ", section "One-liner objections" (Penguin Books, 2011, page 509, ISBN 978-0-241-95868-1. If the Easter Islanders couldn't solve their milder local problems in the past, how can the modern world hope to solve its big global problems? People who get depressed at such thoughts often then ask me, “Jared, are you optimistic or pessimistic about the world’s future?” I answer, “I am a cautious optimist.” By that, I mean that, on the one hand, I acknowledge the seriousness of the problems facing us. If we don’t make a determined effort to solve them, and if we don’t succeed at that effort, the world as a whole within the next few decades will face a declining standard of living, or perhaps something worse. That’s the reason why I decided to devote most of my career efforts at this stage of my life to convincing people that our problems have to be taken seriously and won’t go away otherwise. On the other hand, we shall be able to solve our problems – if we choose to do so. Chapter "The world as a polder: what does it all mean to us today? ", section "Reasons for hope" (Penguin Books, 2011, page 521, ISBN 978-0-241-95868-1. Because we are the cause of our environmental problems, we are the ones in control of them, and we can choose or not choose to stop causing them and start solving them. The future is up for grabs, lying in our own hands. We don’t need new technologies to solve our problems; while new technologies can make some contribution, for the most part we "just" need the political will to apply solutions already available. Chapter "The world as a polder: what does it all mean to us today? ", section "Reasons for hope" (Penguin Books, 2011, pages 521-522, ISBN 978-0-241-95868-1. What are the choices that we must make if we are now to succeed, and not to fail? [...] Two types of choices seem to me to have been crucial to tipping their outcomes towards success or failure: long-term planning, and willingness to reconsider core values. On reflection, we can also recognize the crucial role of these same two choices for the outcomes of our individual lives. One of those choices has depended on the courage to practice long-term thinking, and to make bold, courageous, anticipatory decisions at a time when problems have become perceptible but before they have reached crisis proportions. [...] The other crucial choice illuminated by the past involves the courage to make painful decisions about values. Which of the values that formerly served a society well can continue to be maintained under new changed circumstances? Which of these treasured values must instead be jettisoned and replaced with different approaches? Chapter "The world as a polder: what does it all mean to us today? ", section "Reasons for hope" (Penguin Books, 2011, pages 522-523, ISBN 978-0-241-95868-1. Remember that impact is the product of two factors: population multiplied times impact per person. Chapter "The world as a polder: what does it all mean to us today? ", section "Reasons for hope" (Penguin Books, 2011, page 524, ISBN 978-0-241-95868-1. My hope in writing this book has been that enough people will choose to profit from that opportunity to make a difference. Chapter "The world as a polder: what does it all mean to us today? ", section "Reasons for hope" (Penguin Books, 2011, page 525, ISBN 978-0-241-95868-1. As we shall see in this book's chapters, traditional societies are far more diverse in many of their cultural practices than are modern industrial societies. [...] Yet psychologists base most of their generalizations about human nature on studies of our own narrow and atypical slice of human diversity. [...] That is, as social scientists Joseph Henrich, Steven Heine, and Ara Norenzayan express it, most of our understanding of human psychology is based on subjects who may be described by the acronym WEIRD: from Western, educated, industrialized, rich, and democratic societies. [...] Hence if we wish to generalize about human nature, we need to broaden greatly our study sample from the usual WEIRD subjects [...] to the whole range of traditional societies. Prologue, section "Why study traditional societies?" Perhaps we could benefit by selectively adopting some of those traditional practices. Some of us already do so, with demonstrated benefits to our health and happiness. In some respects we moderns are misfits; our bodies and our practices now face conditions different from those under which they evolved, and to which they became adapted. But we should also not go to the opposite extreme of romanticizing the past and longing for simpler times. Many traditional practices are ones that we can consider ourselves blessed to have discarded — such as infanticide, abandoning or killing elderly people, facing periodic risk of starvation, being at heightened risk from environmental dangers and infectious diseases, often seeing one’s children die, and living in constant fear of being attacked. Traditional societies may not only suggest to us some better living practices, but may also help us appreciate some advantages of our own society that we take for granted. The societies to which most readers of this book belong represent a narrow slice of human cultural diversity. Societies from that slice achieved world dominance not because of a general superiority, but for specific reasons: their technological, political, and military advantages derived from their early origins of agriculture, due in turn to their productive local wild domesticable plant and animal species. Despite those particular advantages, modern industrial societies didn’t also develop superior approaches to raising children, treating the elderly, settling disputes, avoiding non-communicable diseases, and other societal problems. Thousands of traditional societies developed a wide array of different approaches to those problems. Guns, Germs, and Steel pushed geography as an academic discipline into the debates of economic historians in much the same way that Graeber intends for anthropology. David Graeber (5 July 2017). Debt: The First 5000 Years. CRC Press. p. 43. ISBN 978-1-351-35037-2.